Oh dear, my creative yearning strikes again. Please, save me from myself. I’ve decided to try felting, specifically to make a birthday present for my daughter turning 5 in October. I’ve been inspired by her being attracted like a magnet to the felt fairy dolls at a recent Autumn Fair at the nearby Waldorf School. 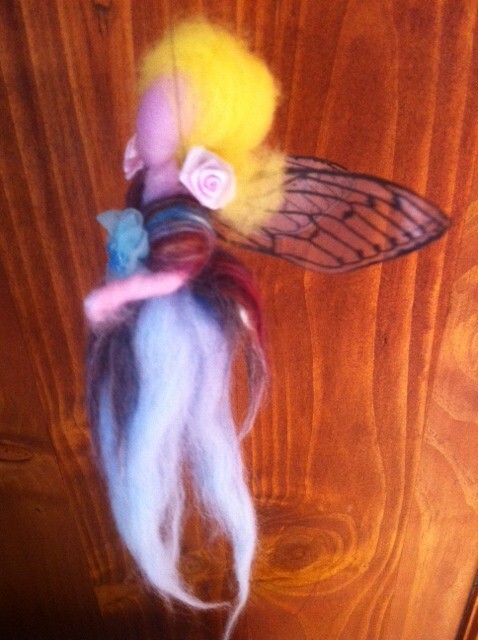 Here’s the little fairy she adopted. There is far too much inspiration around for my crazy mind – felted hobbit houses, fairy houses, woodland creatures, hobbits, wizards, faeries, dragons. I’ve started a pinterest board and already am completed carried away with ideas. I think it will be a castle, with a few villagey houses, gardens with a vegetable and herb plot, and a forest to go around the castle that has a fairy/elven camp in it. A sort of The Hobbit/Jane and the Dragon/Narnia-esque mashup. In fact, I think I will based the character play-pieces on a few of the Jane and the Dragon characters. Also, I plan to make it all from recycled felted woolen jumpers. hah! Ambitious aren’t I considering I’ve never felted anything in my life! I’ve also seen a lot of beautiful felting projects on Little eco footprints blog and love this little fairy house from recycled jumpers. Along with the play set I’m going to make a compilation of ‘medieval/celtic’ music so that I can use this when I play with it while she is at school she can use this as part of her play. All this will have to be created under the cover of darkness so that it can be a surprise. I’ve got 6 months. I’d better get planning and creating…and er…ahem…learning!